A single crocus blossom ought to be enough to convince our heart that springtime, no matter how predictable, is somehow a gift, gratuitous, gratis, a grace. Thank you for the beautiful and gracious reminder that spring will come, even here in Minnesota. 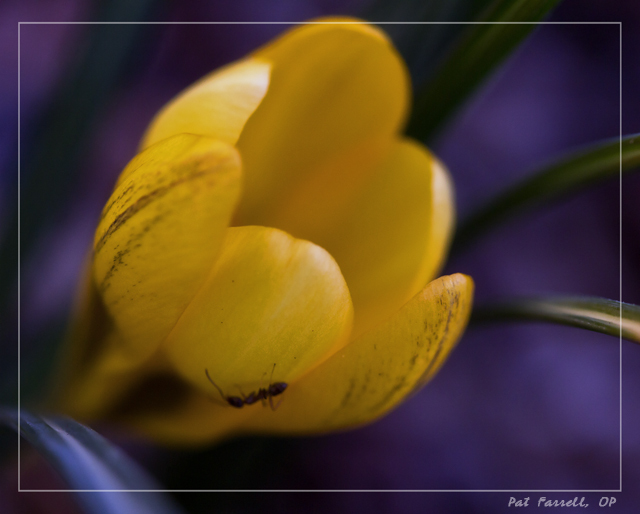 I look forward to the first crocus blossom. I am so spoiled here in California. A couple of weeks ago I had a trip to Michigan. When I got home I snapped a picture of our flowers . . . the redbud, jonquils, poppies, etc., and emailed it to my friends there. I’m sure that the spring will be ablaze with color in Minnesota soon. I recall the countryside there, with all the wonderful lakes, to be quite lovely. Thanks, Rexlin. I had the quote for awhile, and I was waiting for the flower!